In the enemies’ radar: Tre Long (4) calls for the snap with Jackson Grafe (21), Devin Kylany (68) and Logan Bruce-Jones (55) in position in front of a flurry of Mount Vernon fans. The Vikings would keep them quiet as they would win 30-7 over the Bulldogs. Tre Long had his most prolific passing performance of the season, throwing for 189 yards and 2 touchdowns. On a cold, rainy evening in Mount Vernon High School, with the ever-creeping black of darkness creeping around the stadium, only to be stopped by the lights shining over Bulldog Stadium, the Lake Stevens Vikings faced their toughest test from the most unlikeliest of places. After a couple of bumps on the road in the first half, the Vikings got themselves together and beat the Mount Vernon Bulldogs 30-7 in the first of, what would be, a stretch of tough conference games that’ll show what this Vikings team is all about. The Vikings started off with a 3-yard touchdown run by senior Jackson Grafe, his first touchdown since the first game of the season against Ferndale to give the Vikings a 7-0 lead with 3:05 left in the first quarter. As the second quarter rolled in, the Vikings were determined to keep this momentum going, starting with the third interception in four games by Kasen Kinchen to give the Vikings the ball with 8 minutes left in the first half, and while it looked like the Vikings capitalized on the turnover with a 58-yard touchdown pass from senior quarterback Tre Long to senior wide receiver Ian Hanson, it was later called back due to a holding penalty on junior Logan Bruce-Jones, one of two penalties that called back a Long-to-Hanson touchdown connection and one of many penalties that put the referees on hot water towards Lake Stevens. The Vikings would turn the ball over on downs to end that drive and Mount Vernon took advantage of the anger that the Vikings developed over the called back touchdown with a touchdown of their own to end the first half with a 7-7 score. After a few minutes in the locker room, the Vikings put the past behind them as the third time’s the charm for Hanson as he catches a 7-yard touchdown (TD) from Long as the Vikings take a 14-7 lead with 7:43 left in the third quarter and, after a Mount Vernon punt, they score again, this time an 8-yard run by Long to take a 20-7 lead after the Bulldogs block the point after with 3:40 left, but the quarter doesn’t end without a little momentum from the defense. With 1:30 left, Mount Vernon got the ball right through the middle of the defense for, at the moment, a big gain that brought the ball to the Lake Stevens’ 30 yard line, but before the running back could be tackled to secure the big gain, the ball was stripped away by senior Isaiah Harris and recovered by junior Devin Kylany, taking away any hope the Bulldogs have of pulling one of the biggest upsets of the high school football season. As the fourth quarter went underway, the Vikings would score on the ensuing drive, this time it’s a 13-yard touchdown pass from Long to sophomore tight end Max Moenoa to make it a 27-7 game with 9:04 left in the game and, along with a 23-yard field goal by Brock Widmann, finished the game still unbeaten with a 30-7 win. Tre Long finished the game completing 15 of 28 passes for 189 yards, throwing for two touchdowns and an interception, bringing his season total up to throwing 55 for 89 for 675 yards and 7 touchdowns while Grafe leads the run game with 19 carries for 61 yards and a touchdown run and Ian Hanson led the team once again with 5 catches for 66 yards and his first touchdown catch of the season. As for the defense, it was led by Harris, who led the team with 15 tackles to go with a forced fumble and a fumble recovery. 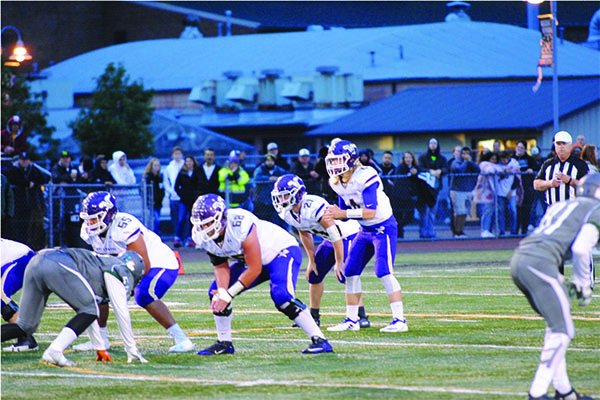 Now 4-0, the Lake Stevens Vikings will play their first conference home game on September 28th as they play the winless Kamiak Knights, who are coming off a traumatizing 68-14 loss to the Glacier Peak Grizzlies.